Forgot to bring your Laser Pointer device during your presentation? Don’t worry PowerPoint 2010 to the rescue!!! 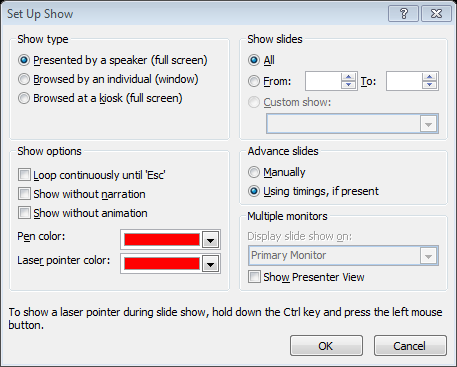 Did you know that, Just by pressing Ctrl key in your Keyboard +Left Click (Hold) during a Presentation Slide Show or in Reading View you can have your own Laser Pointer Device? This is just a tip during your presentation, To emphasize more on the things you are trying to discuss. Can I change the color of my Laser Pointer? 2. Select Set Up Slide Show button in the Set Up group. 4. You have already changed your laser pointer color just press Ctrl + Left Click (Hold) during your presentation slide show or in reading view. This entry was posted on Monday, April 19th, 2010 at 7:27 pm	and posted in New Features, PowerPoint. You can follow any responses to this entry through the RSS 2.0 feed.